The Balearic Islands – of which Majorca, Menorca, Ibiza and Formentera are popular tourist destinations – have formed an autonomous region since 1983. There are also a number of smaller islands, including particularly Cabrera, which is a National Park. 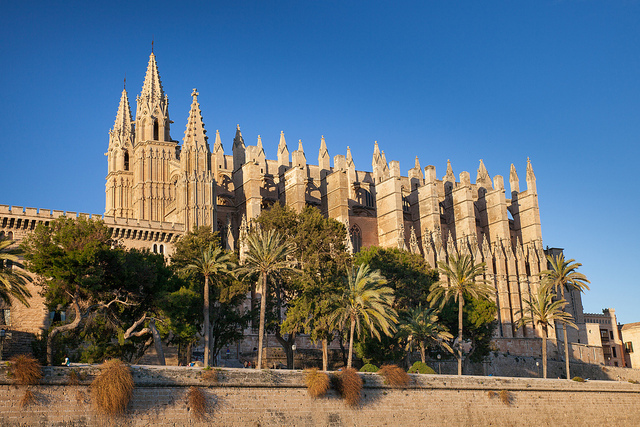 Palma De Mallorca is the administrative, judicial and ecclesiastical centre of the region, as well as being by far the largest city. The Balearic Islands have long been amongst the most popular tourist destinations for British and other Northern Europeans but they have largely managed to maintain their individual identities and, during recent years, have attracted visitors who had previously ignored the islands because of their ‘sun, sand and sangria’ reputation. Although this archipelago between 50 and 200 miles away from the Spanish mainland is always categorised as ‘The Balearic Islands’, there are, in fact, two separate groups. 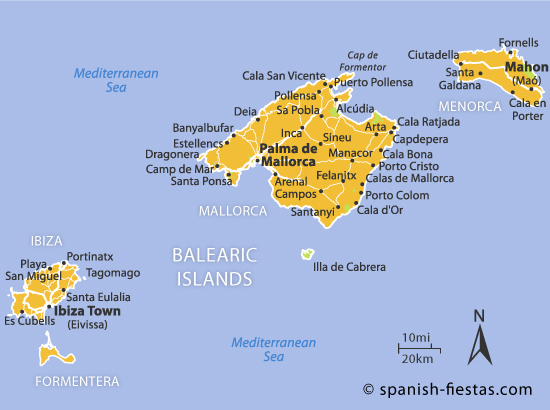 The Balearics ‘proper’ consists of the eastern, largest islands of Majorca and Menorca, along with Cabrera. These islands are often referred to as the Gymnesian Islands, from the Greek word for naked – the explanations for which are numerous. The westerly islands, including Ibiza and Formentera, are known as the Pitiusas, or the Pine Islands. Geologically, the islands can be seen as an extension of the sub-Baetic mountains of Spain, being linked by a sill near Cape Nao, which is at the southern tip of the Bay of Valencia. On the whole, the islands have undulating hills, plateaux and lowlands although there are extended plains in Menorca. Obviously tourism dominates the economy of the Balearics, with over 4 million visitors every year. Although there are many visitors during the autumn and winter, much of the employment arising from tourism is still seasonal, leading to greater unemployment at ‘off peak’ times. Citrus fruits, grapes, olives, figs, almonds, wheat are the main products grown and pigs, cattle and sheep are also farmed. The leading exports are Majolica ware pottery, leather goods – especially shoes, silver filigree and the famous Mallorcan pearls. There is a small industry producing fine lace and embroidery for tourists. Anyone driving from the airport in Menorca to the resorts in the west of the island will not fail to see evidence that the island has been inhabited since prehistoric times. Approaching Ciutadella one passes the Naveta des Tudoms, the biggest and best preserved of the monumental stone constructions that have led to the island being referred to as an ‘open air prehistoric museum’. However, the Phoenicians, Greeks, Romans, Carthagineans, Byzanthinians and Moors all left their marks in the Balearics. 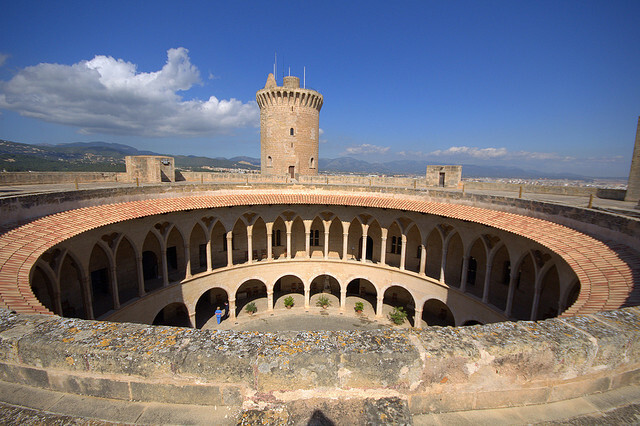 From 1229, Jaime I began the Christian reconquest and Mallorca and Menorca soon became part of the kingdom of Aragón. As part of the Treaty of Utrecht in 1713, however, Menorca was handed over to the British, as can be witnessed by much of the architecture in Mahón. It was returned to Spain in 1802, by the Treaty of Amiens. During the times of the great seafaring ‘pirates’, the smaller islands were often used as bases, even resulting, at one stage, in the entire population of Formentera abandoning the island because of Barbary pirates there. The Balearic Islands were established as a Spanish Province in 1833 and, although there was a nationalist movement at the end of the 19th Century, it never emerged as a powerful force. At the beginning of the Spanish Civil war, both Majorca and Ibiza were taken by Franco’s forces – Mallorca becoming the base for the Italian fleet during the conflict. Menorca, however, remained a Republican stronghold right up to 1939. Climate: The climate of the Balearic Islands is typically Mediterranean, with many sunny days throughout the year. Winters are mild and usually dry, with most of the rainfall during the autumn and winter. Annual precipitation, though, is usually around 450 mm to 600 mm each year. Summer temperatures are not as oppressive as on parts of the mainland because of the prevalent sea breezes, with a maximum in August of around 28° (82°). In January, the visitor can expect maximum daily temperatures of around 13°, with a minimum of 4° occasionally – but still, on average, about 5 hours of sunshine per day. Whilst the summer months attract the majority of visitors who are heading for the popular holiday resorts there are still plenty reasons to visit during the low season provided guaranteed sunshine isn’t your only requirement. Balearic Festivals: Festivals in the Balearics are similar to everywhere else in Spain – plentiful, vibrant and full of local significance. The Three Kings and Semana Santa processions in the major towns offer unforgettable experiences when seen for the first time and all have their own unique local flavours. But, there will seldom be a time of the year when there isn’t a festival of some sort going on somewhere. For example, on the first Sunday in May in the festival of Santa Eulalia in Ibiza, there are dazzling displays of coaches and horses. On the second Sunday of the same month, you can go over to Mallorca, to Soller, to see a reconstruction of the fight between the islanders and the Saracens – similar to the battle with the pirates in Pollença in August in the festival of Nuestra Señora de los Angeles. A little more sedate, usually, is the annual jazz festival in Palma De Mallorca each July. 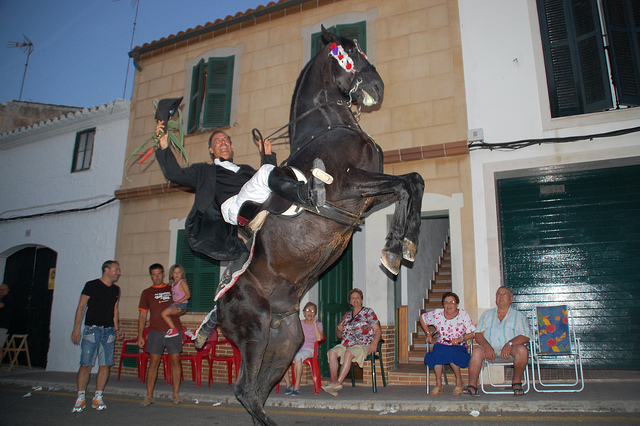 The most important annual festival in Menorca is arguably San Juan on June 23rd and 24th. The locals claim that the Mahón festival has been more or less unchanged for 600 years and climaxes with lavish horse parades and medieval events. Most people arriving in the Balearics do so by way of the three main airports at Palma De Mallorca, Menorca and Ibiza, which offer excellent links with Spain and the rest of Europe, as well as attracting cheap flight operators and charter airline companies. There are efficient shuttle bus services from all the airports to the main resorts. For those who would prefer to reach the islands by sea, there are numerous excellent regular ferry links between the major islands and Barcelona, Valencia and Dénia. On the islands themselves, the majority of the roads are very well maintained which is ideal for the vast number of visitors who rent cars for the duration of their holiday. Regular public transport buses, of a good standard, offer visitors a cheap way of getting around but, as might be expected, services are curtailed on Sundays and most public holidays. One of the great treats for many people – and not simply train buffs – is the opportunity of going from Palma De Mallorca to Sóller by rail. The carriages are delightful and the views simply outstanding. Even if you hire a car in Mallorca, this is something you won’t want to miss. Mallorca: Palma De Mallorca is undoubtedly one of Spain’s most attractive cities, even allowing for the tourist development that has swallowed up parts of it. The old quarter of town is full of atmosphere and interest – both by day and night – and the enormous cathedral, with its own Gaudí designed section – is a spectacular building. Bellver Castle, built on the remains of a former Muslim site, affords great views of the bay as well as housing many sculptures and antiquities of great interest. The island itself has some wonderful beaches and attractive seaside towns, as well as the popular package resorts such as Magaluf and Palma Nova. Smaller places such as Port d’Andratx, Sant Elm and Cala Mondragó offer a much more relaxed experience. Mallorca has also become a popular destination for bird watchers, hikers and cyclists during recent years. Mallorca’s advantage over other Mediterranean islands is the fact that it alone has the significant marshland known as Albufera, which means that waders and other water preferring birds call in on their migration routes. What might surprise many visitors is the sheer beauty of much of the Mallorcan island – both coastal and in the interior. Inland towns such as Artá, Fornalutx and Pollença and some breathtaking coastal scenery can prove to be completely beguiling and offer very different perspectives of the island. Menorca: Menorca has three towns in particular which offer totally different experiences. Mahón, or Maó, is spread around its enormous natural harbour and has some stunning Georgian architecture, fantastic views and is home to the captivating and aromatic Menorcan Gin – there is a variety that is made with lemon, which is absolutely unforgettable and will tempt you into thinking about breaking duty free allowances! At the opposite end of the island is the contrasting city of Ciutadella; an attractive, rambling port of simple whitewashed houses, stunningly elegant palaces and a typically Spanish, palm-tree lined main square. For a taste of Menorca’s high society, the former fishing village of Fornells is the place to go; a favourite holiday destination for, amongst others, the Spanish royal family. Although a little more expensive, the lobster here is justifiably famous. This is the centre for windsurfing and yachting. Visitors to Menorca, though, cannot help but see the numerous reminders of the island’s prehistoric heritage – most of which are open to the public, although not always with easily accessible footpaths. Ibiza: Ibiza has long been synonymous with fun-packed clubbing holidays and they are certainly still well catered for, although thankfully the amount of associated mayhem has seemed to decrease in recent years. Some of the very best clubs in Europe can be found in Ibiza Town and San Antonio and regular visits by leading artists and DJs make sure that Ibiza retains its ‘cool vibe’. Aside from that, however, Ibiza is a delight for those looking for a diving or a sailing holiday and, like the other Balearic Islands, it has some spectacular coastal scenery – indeed, large parts of the island are registered as United World Heritage Sites. There is always something to see and do in Ibiza. And that’s not something you can readily say about Formentera. If you want night life then it would be best to go somewhere else. If you want an almost deserted beach, bumpy roads and small, sleepy fishing settlements, then Formentera is worth a ferry ride from Ibiza. This island is the exact antithesis of Ibiza Town and, for many, that is its biggest attraction. There are ‘resorts’ here – but places like Es Pujols and Es Ca Marí have retained their age old character. Walking out to the lighthouse or the dilapidated watchtower is more common than raving until breakfast time. The Balearic Islands have become very popular with hikers and cyclists as well as those looking for water sports activities. Nowadays they have quite a reputation for the quality of their cycling routes – for this reason they are often used by professional cyclists for winter training. Whether your interest is road cycling or mountain biking, you will find many opportunities here. Similarly, all of the islands have well-developed hiking routes and well-produced maps for visitors, with routes suitable to all ages and experiences. In addition, the warm, clean waters of the Balearic Islands provide ideal conditions for people interested in water sports activities such as sailing, diving and swimming. And as mentioned earlier, Mallorca attracts many bird watching enthusiasts – Black Vultures, Eleonora’s Falcons, Audouin’s Gulls and some very rare warblers can all be seen here and there is plentiful information available about the best times to come to catch migratory species. If all this activity sounds far too hectic for liking then fear not, you can simply chill out by day and enjoy the excellent food and wine of the islands by night. Internationally, the Balearics’ greatest contribution to gastronomy is probably mayonnaise, which was first produced in Mahón. Other local dishes include Sobrasada Mallorquina, a very spicy sausage; cordero asado al estilo de Mahón, a slow-roasted lamb dish; tumbet, a delicious mixture of potatoes and aubergine covered with tomato and pepper sauce; rostit, roast pork with liver, eggs and apples; and, of course, especially in Menorca, Caldereta de Langosta, lobster and other seafood with peppers, onions, garlic, tomatoes and herbs. On all of the islands, you will encounter coques, small tartlets of meat, fish or vegetables. Wine production has enjoyed something of a revival in the Balearics, especially in Mallorca, where there are now two quite widely recognised D.O.s – Pla i Llevant and Binissalem. Neither of these can usually be found on mainland Spain because production is quite limited but both offer quite tasty reds, in particular. Mallorca produces some quite tasty liquors, Ibiza a distinctive herb-flavoured variety, and, of course, there is the unforgettable gin of Mahón. Catalan and Castilian Spanish are both recognised as co-official languages in the islands and it has been estimated that over 700,000 of the population can speak Catalan fluently and many more understand it. The local Catalan dialects are known as Mallorquí, Menorquí and Eivessenc and there are significant differences between them and the Catalan spoken on the mainland. Many inhabitants are bilingual in Catalan and Spanish and many, the young especially, can be expected to speak either German or English because of the tourist influx of the past forty years. What Do You Think of the Balearics? If you’re a fellow lover of the Balearic Islands I’d love to hear from you. Any recommendations that you think might be useful for our readers would be most welcome in the comments section below. Don’t forget the wonderful caves on the island the Drach and the Hams! Fantastic adventures! Also the Majorica pearl factory, Valledemosa and the monastery where the Polish composer Frederick Chopin and the French writer George Sands lived in 1838. So many little treasures to be found on Mallorca 🙂 Your article was great and made me very homesick! Thanks Sheilah … great additions. Have been to all the islands, but for me you cannot beat Ibiza. I’m not into clubbing so go to Es Cana, on the quieter side of the island, great food & wonderful local people. Many thanks for your beautiful photos remembering delighfull days in Mallorca. I enjoyed the days and music and flamenco., Very interesting and full of emotions.